Well-worn footpaths exist in cities, suburban areas, and even the rural wilderness, but did you know they had a name? I didn’t until reading an article about their prevalence in other areas. They are referred to as Pathways of Desire and represent the shortest path between an origin and destination where no constructed walkway exists. The topic of dirt paths in Raleigh may seem dry on the surface, but it provides a unique look on demographics and pedestrian movement. In the case of Compiegne Park (above) it represents a flaw in the park’s design. 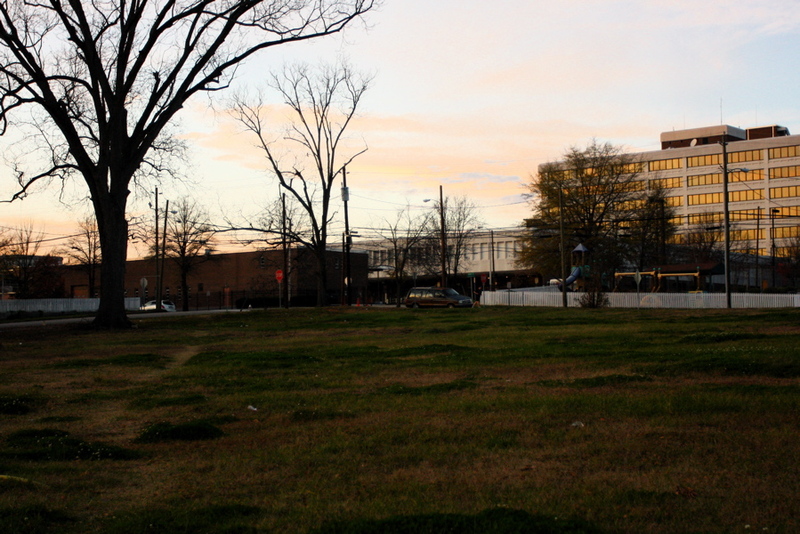 The tiny park is a triangle, and the entry point from the north point gets to Hillsborough Street quicker straight through the middle. 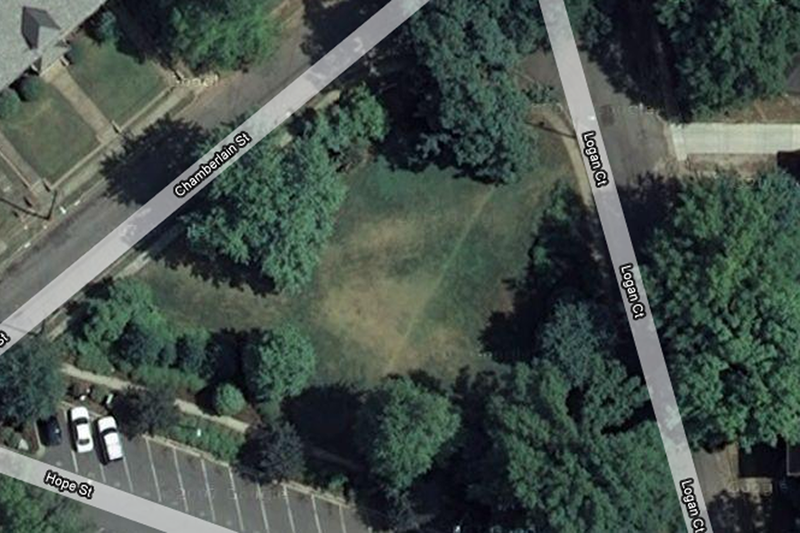 I spent a very modest amount of time (less than an hour) looking at this path and others with Google Maps. I knew of a few from memory near where I live, but didn’t know about any in other parts of town. The red pins indicate areas that may or may not be a footpath. The map is a work in progress and by no means comprehensive. It was clear after spending a couple of days wandering through sections of town where they were the most, and it was represented in the map above. At first, I tried to go to specific locations. Eventually I abandoned that plan and found my own shortest route between destinations (paths). This was in the southeast part of the city. There are many factors influencing the concentration in the area: more vacant lots in this part of town, more pedestrians that are more reliant on public transportation than other demographic areas, and so on. The footpaths provide an interesting glimpse into the differences in geographic areas within one city. Although mostly unrelated, it is interesting to note that the region with the highest concentration of these footpaths also has the fewest number of sidewalks. 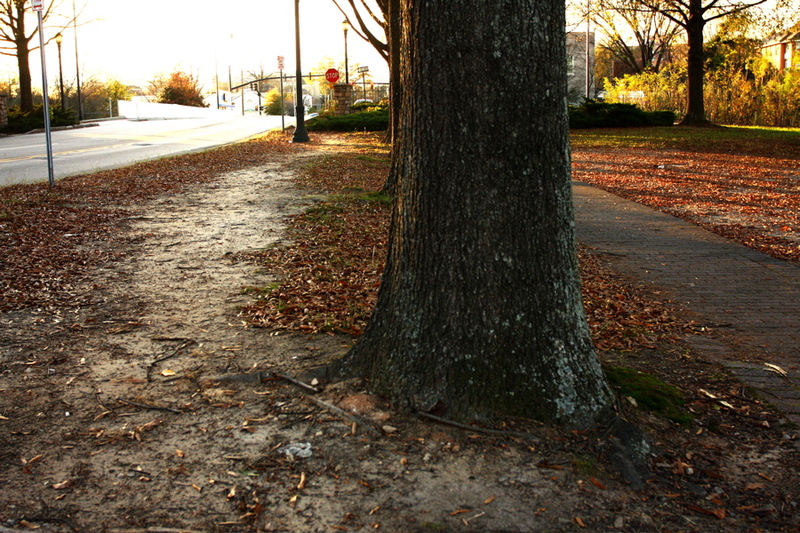 Pathways of Desire are often the basis for many of the roads that exist in cities in which the layout was not pre-planned. The pathways that people carved out by foot were typically the easiest to grade and clear for horses, carriages, and later cars. This wasn’t the case with Raleigh, though, as it was planned from the beginning. The existence of these paths occasionally seems odd, like in the photo above in which they run in parallel. I believe the sidewalk had existed when the block was originally a set of storefronts, so it was offset from the road a good length. 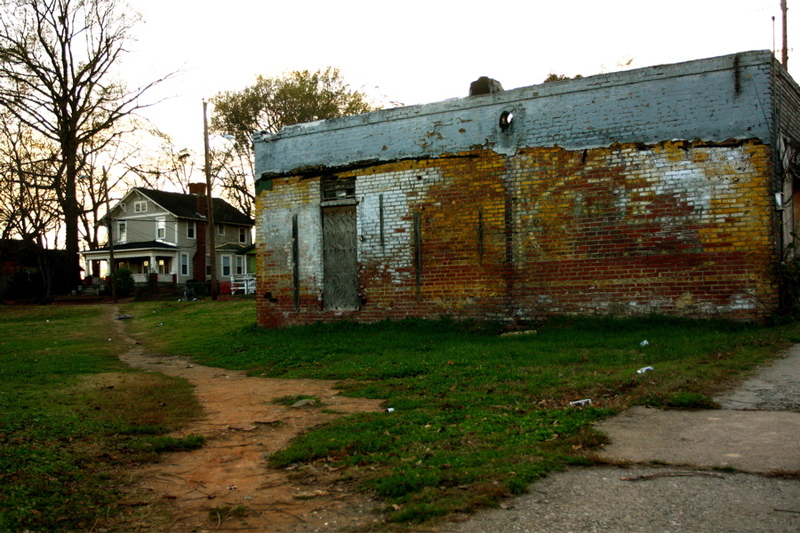 Although currently prevalent in southeast Raleigh, they will decline in number as infill and urban renewal continue to take place there. The empty lots that save walking travelers a few seconds time will eventually be developed in some form and the time savers will once again return to traveling on the grid. The pathways of desire will thin out, but will never be completely erased. There’s one between East Park Drive and West Park Drive in Cameron Park. Effectively, it “connects the dots” between where Benehan St. and College Place terminate. Very nice. I can confirm the path over near Lee Hall at NCSU crossing the train tracks. Some of the paths look like they exist not because of lack of funding for proper facilities, but because they cross private property and are illegal. There a lots of these I run across in the woods, hard to find from aerial photography. I never gave them much thought before. Gomek – I am frequently in that area and I can’t immediately place it. thanks for the tip! dwight – You are correct in that many cross private property. In the map, I didn’t mark places that were in someone’s backyard or occupied property. It was also easier to find in Southeast Raleigh because there are fewer trees there, which results in less foliage on the ground to cover them up. There’s a pretty important one in the grass right by the DH Hill Library, at NCSU. I use these on the IUPUI campus in Indy all the time. 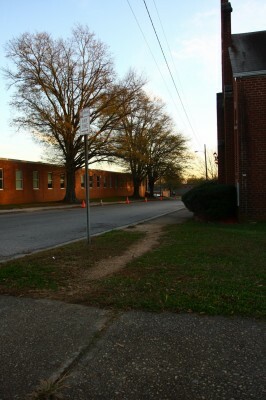 A courtyard that has some sidewalks that go at right angles to each other are largely bypassed by trails of desire. I often wonder if universities recognize these and plan on adding future walks instead of letting them turn into mudholes. The one pictured near State Street/DMV is due to no sidewalks. Of course the DMV wants everyone to drive everywhere, so this isn’t a surpise. The “paths around no tresspassing signs” is landed owned by a former mayor and is now owned by the Raleigh Rescue Mission. 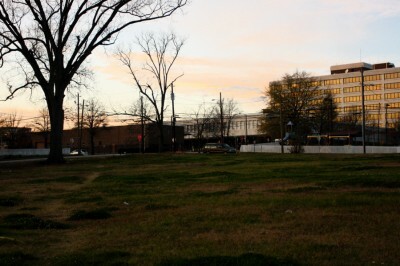 They wanted to turn the site into a dorm/church/clinic/whatever years ago, but Oakwood shut them down. They seem content to leave the land empty. 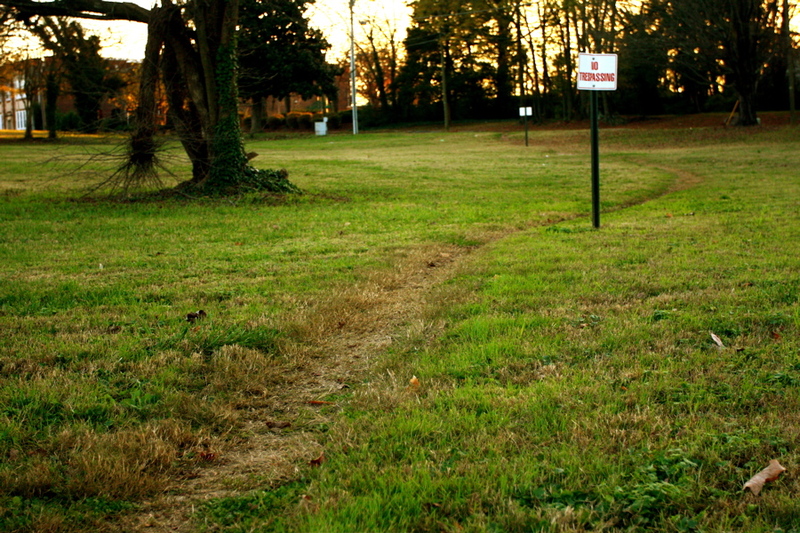 The “path behind the building” is on East Martin on land owned by the City of Raleigh. The city has been assembling parcels for years. Vocal memebers of “the community” (but not the *neighborhood*) have squashed redevlopment in the area for years.